Chilly nights call for a warming bowl of pasta. 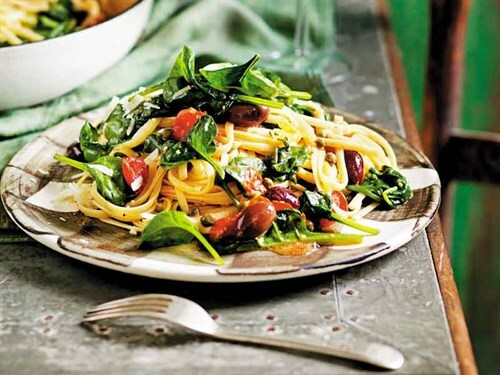 Check out this easy one-pot linguine recipe with spinach, tomato, and lemon. Bring the water to the boil in a lidded large frying pan over high heat. Add the pasta, tomato, rind, oil and salt. Cover; return to the boil. As soon as it comes to the boil, uncover and cook over high heat for eight minutes, turning the pasta regularly with a pair of tongs to stop the pasta sticking to the base of the frying pan. Meanwhile, combine capers, olives and extra oil in a small bowl. Remove pan from the heat. Add spinach and half the parmesan; toss gently with tongs. Season to taste with salt and freshly ground black pepper. Top with the caper mixture and the remaining parmesan. Serve immediately. Looking for a budget dinner? Check out this delicious recipe of smoked trout rice cakes.